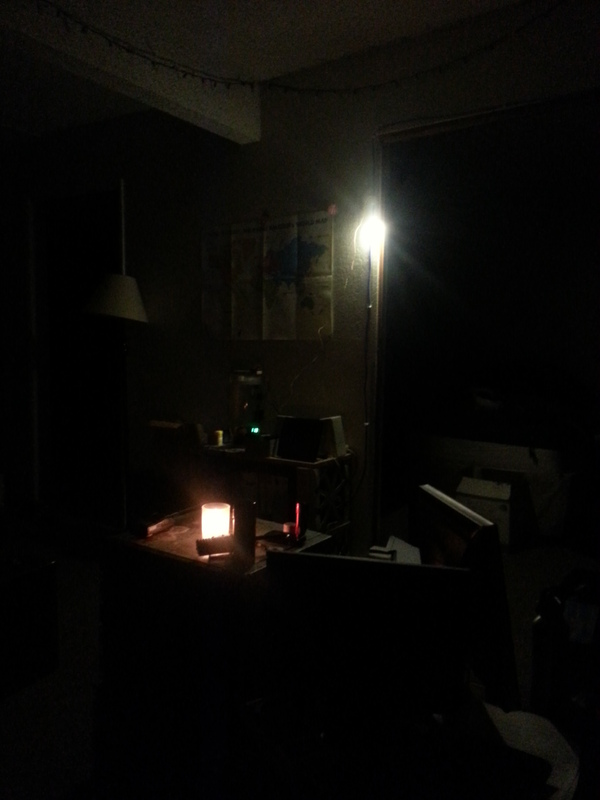 Sunday night in San Luis Obispo, we experienced a very odd brown-out / black-out condition for several hours. I was walking over to a friend's apartment, when suddenly all of the street lights went out. This by itself isn't a very odd failure, but then immediately Marcel (who has been crashing on my couch) calls me on the W6BHZ repeater and asks if it's normal for my apartment's wall power to drop to 75VAC. It very much is not normal. My apartment's wiring is bad, and often sags several volts (120->115VAC), but 75 is ridiculous. I look around for the nearest lighted window, and yeah, SLO power is grossly missing volts. Other amateur radio operators jump on and confirm with their multimeters that voltages across SLO are varying from 70-80VAC. The county-wide SLOECC repeater was having the same sort of conversation, but wasn't scaling anywhere near as well as on our local campus repeater. We clearly needed a net control operator to get people to stop talking over each other and only pass useful information on such a long-range channel. Sadly, it didn't sound like any of the other ECCs were activating, so over the W6BHZ repeater we organized a carload of hams to get to the club's ECC-16 on campus. While they were en-route to campus, I talked Marcel through how to operate one of my latest projects, which is an emergency 12VDC system for my apartment. 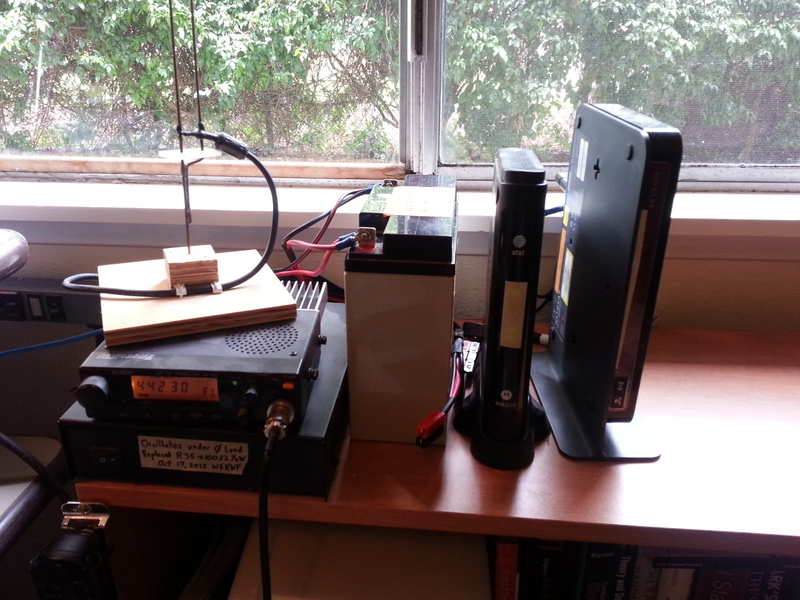 All of my routers, my radio, my USB power strip, and some LED lighting are all run off of a 17Ah lead acid battery in case of lost power. I had actually just done some of the major wiring for this project Sunday afternoon, so all Marcel had to do was by-pass the unfinished change-over controller from wall to battery power. This meant that my apartment had Internet, WiFi, emergency LED lighting, and USB power (which came in handy when more hams showed up at my apartment with dead cell phones). Marcel was then able to activate the SLOECC net until we were able to spool up the campus ECC on generator power. The project isn't completely finished yet. I'm having some noise issues with the long 12VDC runs throughout my apartment (which is piggy-backed on some of my 100bT Ethernet links using passive PoE injectors), and the 17Ah battery really isn't big enough. Between the routers and lighting, the system draws two amps before you factor in transmitting on the radio and >10W of cell phone charging. I have a 400Ah flooded pack ready to be added to the system, but need to route wire between my patio and my bedroom distribution point. My landlord wouldn't mind me drilling some holes, right? The biggest lesson to take away from this event was probably the USB power issue. We have backup power for the radios and lights, but clearly the next generation of ECCs need to put more thought into how to keep everyone's mobile devices charged. We were lucky that this was only a single-evening event, since my system was down to 11.7V by the end of the evening, which was just above my 11.5V cut-off voltage, and our ECC didn't have any additional gasoline for the generator after what was in the tank. The extra 15W of cell phone charging load on top of the 20W of routers and lights was higher than my original power budget had planned for, and made a huge difference. I'm now designing a high efficiency and high power/port count USB charging station, as an improvement to my USB power strip, which is only powerful enough to fast charge a single smartphone at a time. It's going to be based around one of CUI's quarter brick DC-DC converters, which they were kind enough to give me last month. Crazy, power outages can be crippling in both rural and urban environments. My current home has exclusively electric appliances so we have to abandon ship in the event of power failures during inclement weather. I grew up in a rural environment so we had a second panel and a generator for when the power cut out and mostly gas appliances. The power system in the U.S. is more like a third world power system than anything at the current moment. My dream right now is to start a co-operative and build a 3mW turbine with a 5mW storage array next to it. In essence it would cut National Grid out of the picture. Cost right now is about $18,000 but would cover close to 500 or so homes with about 5kW. I have yet to check into what federal and state breaks we'd get. And this past winter we went FOUR days without power in the god damned Capitol city. Utility providers need to bury every bit of cable. The storms aren't getting any weaker. Forty years ago I was an emergency radio operator for Civil Air Patrol. It is good to know there are still people like you and your club to help us through disasters. Besides, it's a lot of fun isn't it.